How safe is the water your child is drinking? Sadly, in some cases, they can't give you a clear answer. Some schools aren't even testing for lead as there isn't a federal mandate that requires them to do so. 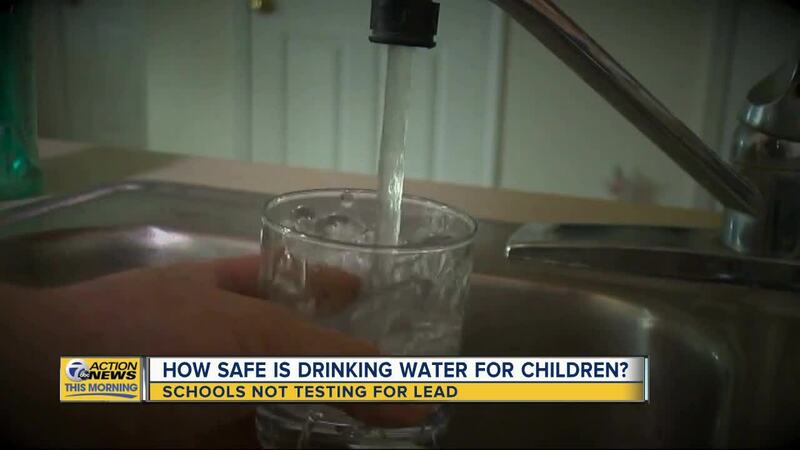 There is an assumption that when you send your child to his/her school that they’re safe — water experts say there’s no guarantee if their school isn’t testing their water for lead. It’s been more than three years since the Flint water crisis, but few actionable steps have been taken to test for lead. Michigan legislators didn’t take action on a bill in 2018 that would have required testing. At this time there is no federal mandate for schools to test either. Walker knows something about school testing — her group just tested more than 900 schools in Indiana for lead. While water leaves a plant clean, and is regularly tested, what isn’t tested is what ends up at the other end of the tap. Schools are typically older buildings that were built when building practices were different. Lead wasn’t regulated in plumbing until the 1980s and even until 2014 “lead-free fixtures” could have up to 8-percent lead inside, that leaves all sorts of potential issues for water inside schools. Walker cautioned that it doesn’t mean the sky is falling. However, without testing larger issues will remain unknown. Is Michigan doing enough to protect school children from lead? In 2018, a worst-case scenario was exposed at Detroit Community Public Schools — the testing was voluntary, had the district not made the move to test water inside their schools children would have continued to drink the water. Instead, drinking fountains were shutoff and water stations were moved into the school. Long-term plans are now underway to overhaul how water is delivered to the school through filtration systems. The bigger problem is that many schools don’t test for lead in water. A study from the Government Accountability Office that was released in 2018 showed that 41-percent of schools in the United States had not tested their water. That’s why groups are hopeful that a federal solution can be made, not only for testing but for corrections — what researchers find is that testing can be a challenge for some districts because they don’t have the funds available. 120WaterAudit has estimated that it would $150 million to test public schools across the country, that doesn’t include the cost to fix the schools found to have trouble or the staff/oversight. There are also daycares and private schools that aren’t factored in, but experts warn that more needs to done. “If you don’t go in and get a baseline sense of whether or not there is an issue within you’re school you’re opening up your kids to risk,” said Walker. In Michigan the state is offering on-site technical assistance to address lead plumbing in schools throughout the state. The Michigan School Water Training Program (SWTP) is available to all schools looking to identify school plumbing containing lead, but at last check only 28 schools have reached out to the state for that help.